I don't know about your family, but in mine the fried egg sandwich was the quintessential "go-to" lazy day comfort food dinner. I don't know what it is about a fried egg and a slab of cheddar slapped between two pieces of toasted bread, but it almost always sounds good. You can make it in about five minutes and I can just about guarantee you'll have the ingredients on hand. The other thing that's awesome about this sandwich is that, much like any other sandwich, it's infinitely customizable. The only thing that must remain is the egg. Switch out everything else, but as long as you keep that egg you can label it a "fried egg sandwich". Unless of course you scramble the egg. Then it would have to be a "scrambled egg sandwich" wouldn't it? But, as my brother would say, I digress. Monday- who knows. This is Travis' day off, so we don't plan anything. Usually we eat out or make something easy at home. Tuesday- normal, but I can plan something a little more complicated or time-intensive because I don't have afternoon or evening activities. See? Just a little structure. So back to Sunday. We usually aren't super hungry on Sundays because we have a late lunch and just spend the afternoon napping or doing lazy things, so a light supper of sandwiches and smoothies (I'll have to share my staple smoothie guidelines with you soon!) is just perfect. The other day, though, we decided to go a little crazy on our sandwiches. You know, break out of the order and make some chaos in the kitchen? It was fun and the end result was amazing. Best fried egg sandwich ever. I want to share it with you, not because it's an amazing recipe you need to follow step by step, but because I want to give your imagination a springboard to create your own fried egg masterpiece! But seriously, if you wanted to recreate this sandwich exactly as we made it, you really would be making a wise move. Because it is incredibly yummy. Yum-tastic. Even. But you knew that when scrolled down and peeked at the ingredient list, didn't you? And you thought I wouldn't notice. Yes, as we all know, bacon makes everything more amazing. So does fresh, ripe avocado. And cheese. Especially Tillamook Vintage White Cheddar cheese (as previously established). Oh, and bagels! Bagels are, of course, also on the amazing list. So make your list, check it twice, and make some new traditions in your house! Fry eggs to your desired doneness, seasoning with salt and pepper or Lawry's seasoned salt. Meanwhile, fry bacon and toast bagels. If desired, butter bagels lightly. Spread one half of each bagel with half of mashed avocado. 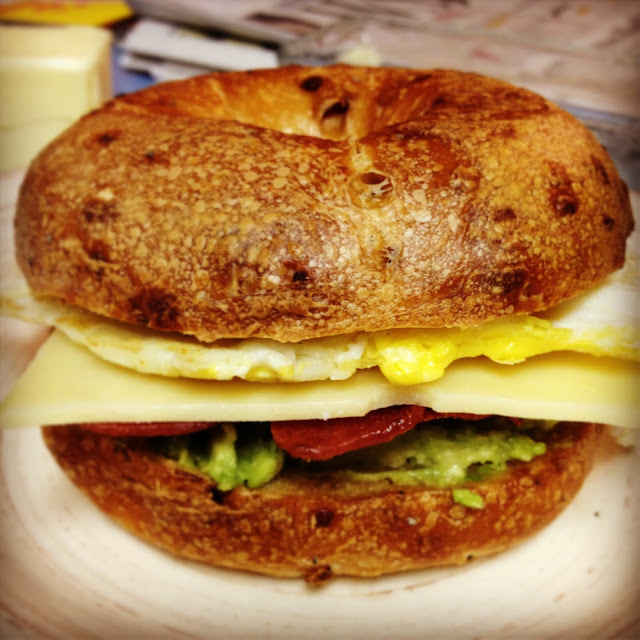 Assemble: place two bacon slices on top of avocado, top with cheese, egg, and other half of bagel. Enjoy! Mmm, We just had fried egg sandwiches the other day for lunch! I like mine with a little horseradish and ketchup! Mmm! Sounds yummy!